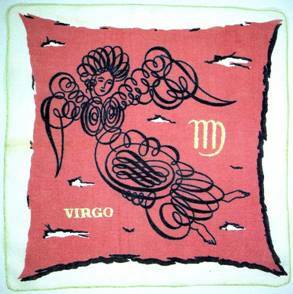 Whether you’re astronomer Johannes Kepler, physicist Stephen Hawking, or just a stargazer admiring the heavens on a warm summer evening, the vast velvet vault overhead twinkling with constellations has captured man’s imagination for centuries. Whether a fiery gold harvest moon or icy silver sisters of the Pleiades, the firmament dazzles us in awe and wonder. 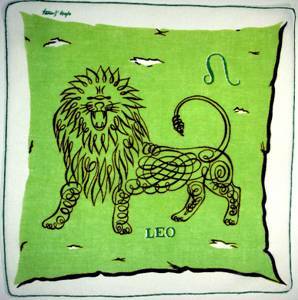 Since man first studied the skies, he’s built temples to the sun, tracked the phases of the moon, and named the constellations, from Aires to Andromeda, Orion to Pegasus. 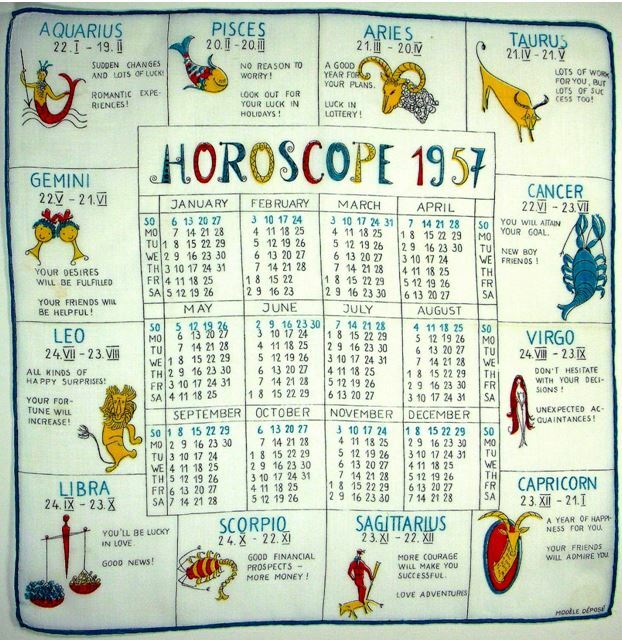 Some believe the time and season in which a person is born has an influence on their character, and indeed the study of astrology is centuries old. 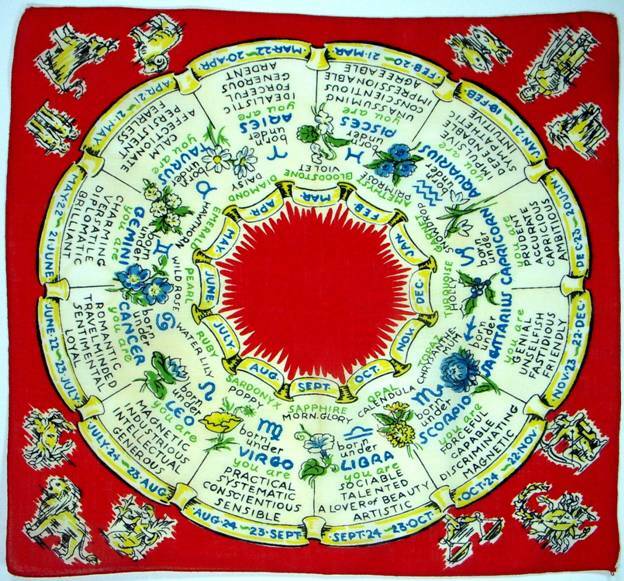 With our most recent blogs celebrating birthdays it seems only natural to follow them with birth signs, an extremely popular subject for handkerchiefs. 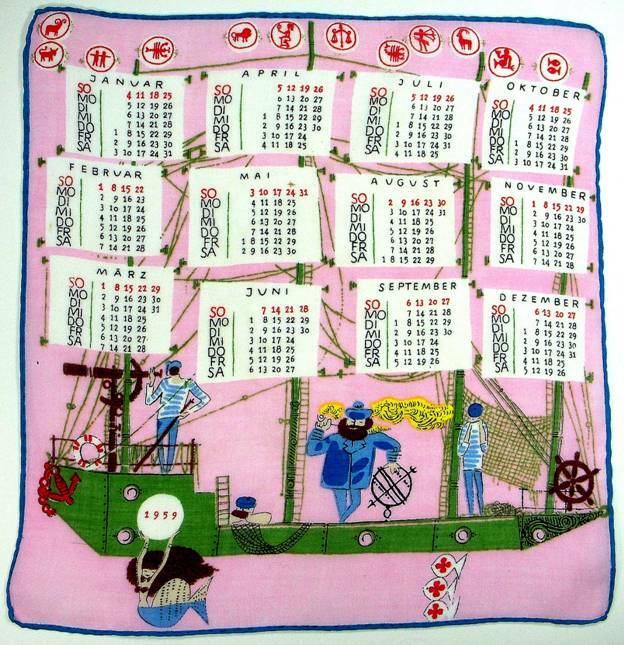 Sometimes the images are quite subtle, as in these calendar hankies. 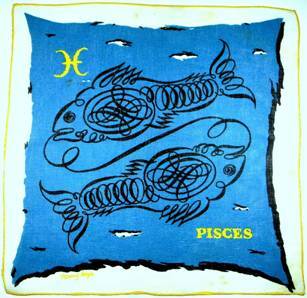 In this seafaring voyage, signs of the zodiac float cloudlike along the top border. 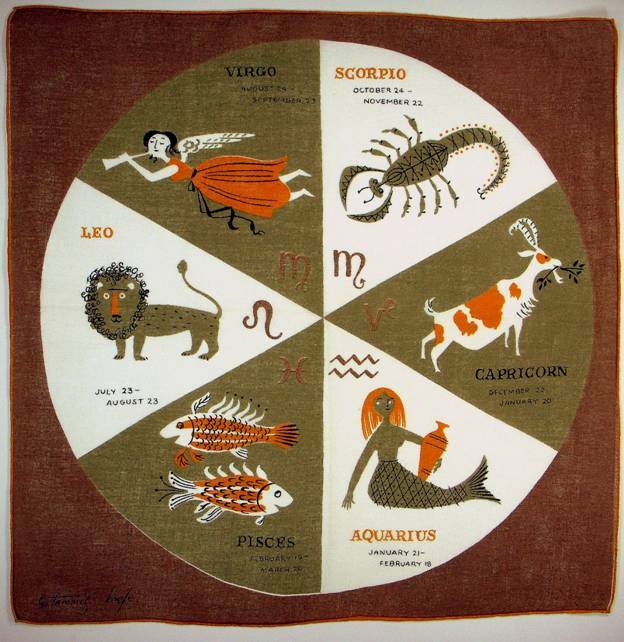 Zodiac signs are scattered hither and yon on the left, while they anchor the core of a calendar clock on the right. 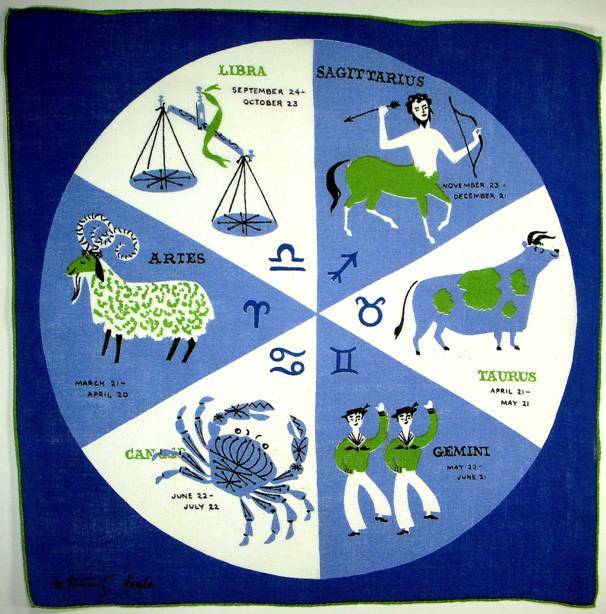 This hankie provides ample fodder for astrology skeptics as it promises “Good News! New Boyfriend! 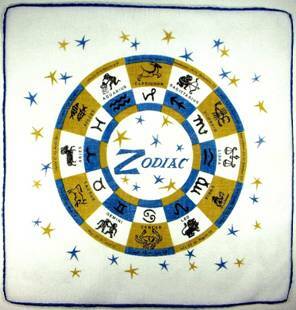 Luck in Lottery!” and all manner of dreams come true for each and every zodiac sign. 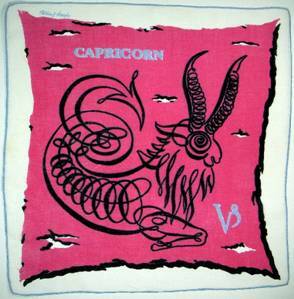 An oh-so-handsome scallop-edged charm bracelet hankie with Capricorn assuming the lead role. 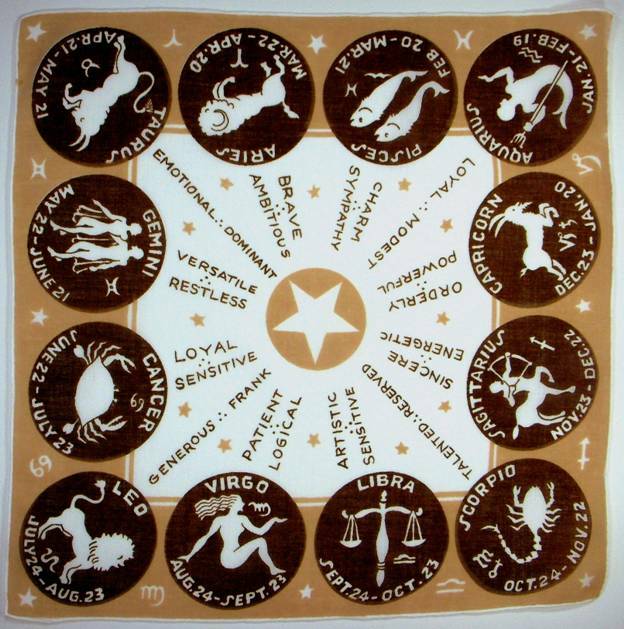 What’s your sign? 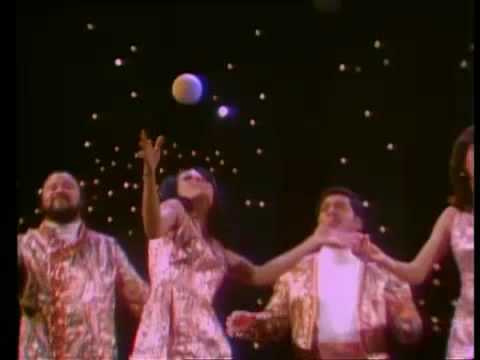 Has been a standby conversation starter since time immemorial, but experienced a surge in popularity with the release of the 1969 hit song “Age of Aquarius” by the Fifth Dimension. 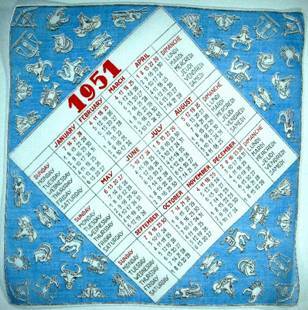 While others include signs, images and dates. 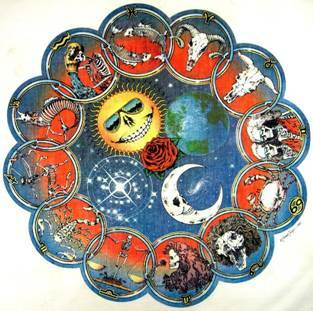 Still others are wildly imaginative, like this Grateful Dead skeletal zodiac bandana! 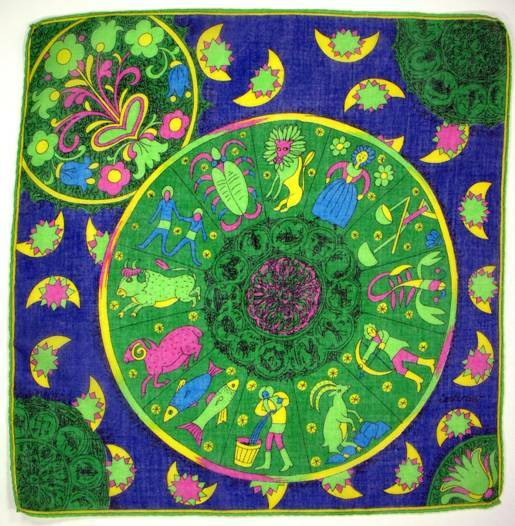 Still others are fanciful and dreamy with floating moons and stars. 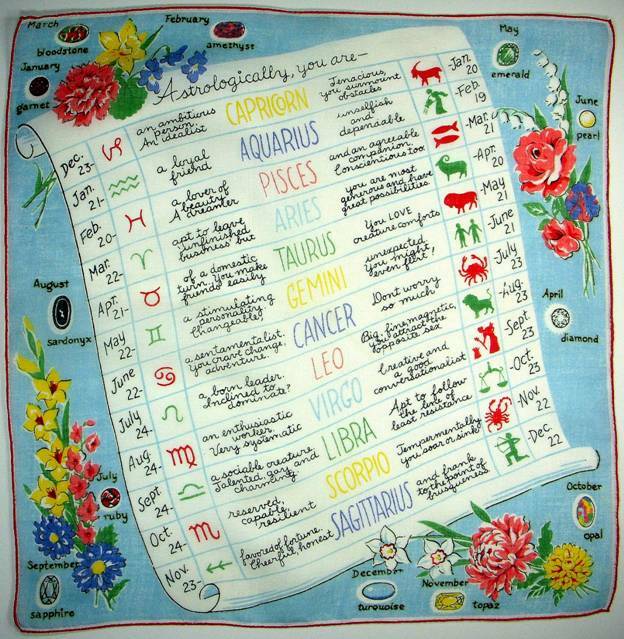 Rather than squeeze all twelve zodiac signs on one hankie, artist Tammis Keefe divided the year in half, featuring six images at a time. With plenty of room to play, her bold graphics command the canvas, allowing you to focus less on information and more on imagery. 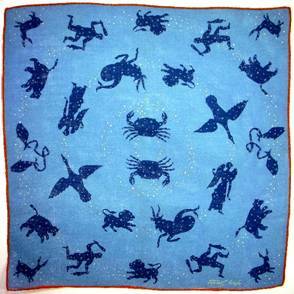 As always, she manages to balance bright patches of color with just the right amount of detail to intrigue the eye without being “overworked.” Note the artful line detail on the crab and the scorpion. 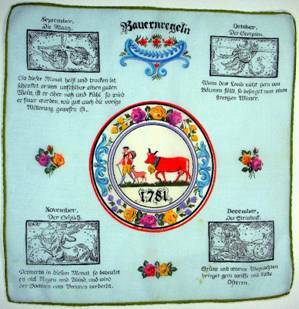 Some handkerchiefs depicted four images at a time, as does this pair of German hankies. 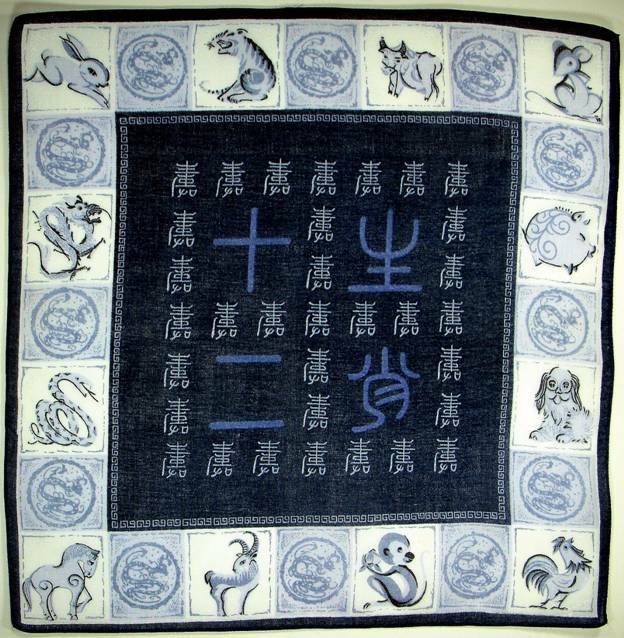 A handsome monochromatic hankie depicts the Chinese zodiac figures – rooster, rabbit, rat, horse, ox, etc. 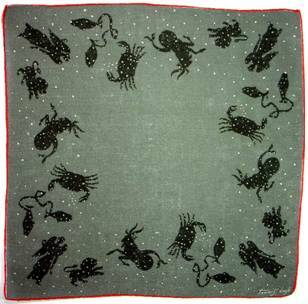 I wondered if perhaps this hankie was printed during the year of the snake since snakes adorn the border in alternating squares. 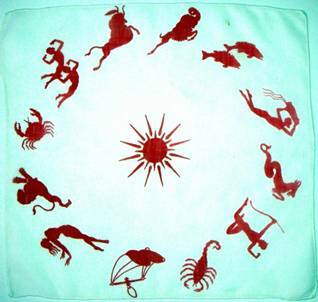 Note the Chinese zodiac images differ from western zodiac characters, which is not surprising, since each culture views the world through its own experience. This difference is beautifully illustrated in the Star Map at the Hong Kong Space Museum. 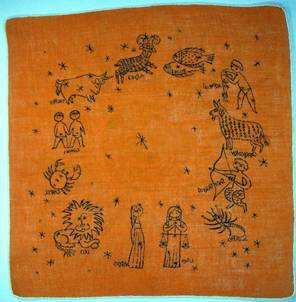 The exhibit consists of a large map of the heavens. An enormous piece of plexiglass rests on top of the map, covering it entirely. There are lines etched into the plexiglass, but you don’t see them. Press a button, and fiber optic light shoots through the plexiglass, illuminating the etched lines which connect the stars into images seen by eastern civilization – dragons, flying fish, etc. Press another button and a second set of lines illuminate, showing how the western world views the same stars – Orion, the Pleiades, the Big Dipper, etc. It’s extremely interesting. One sky, but two completely different interpretations. 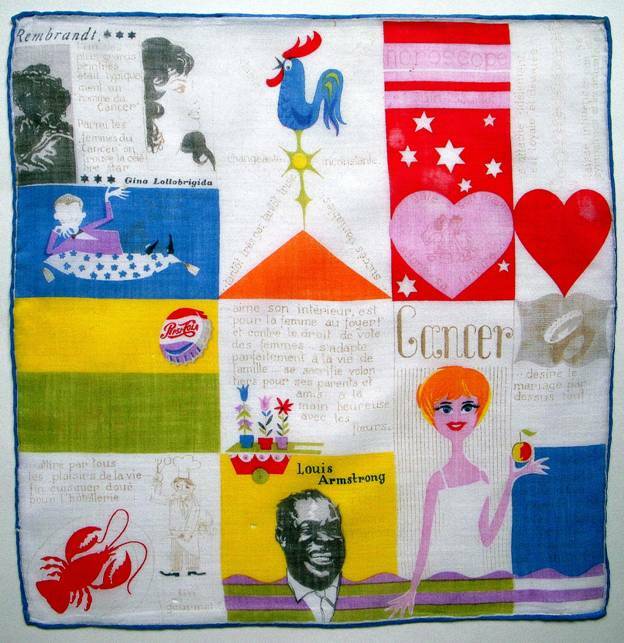 In a small way, this pair of handkerchiefs by Tammis Keefe somewhat illustrates the experience I’m trying to describe (although here both images are done by a single artist). One person might see a flying goose, while another person sees an angel. 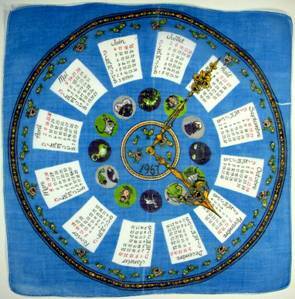 Interestingly, ancient Chinese astronomy does not include the southern sky. 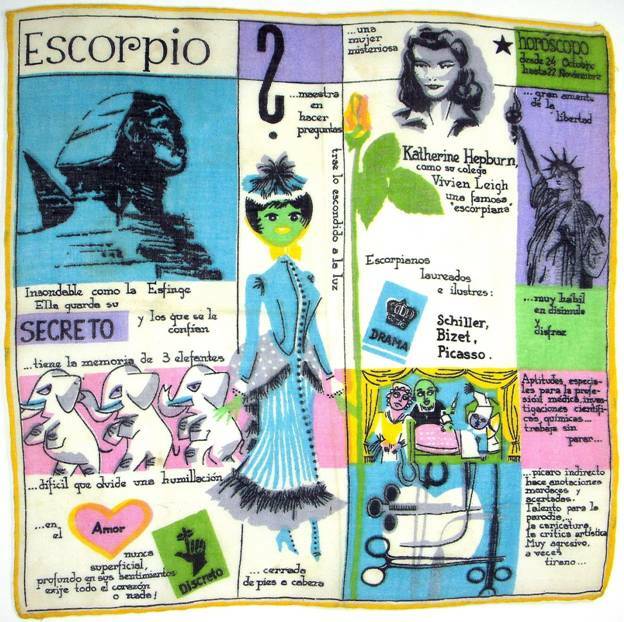 It was unknown to them until advances in travel allowed them to venture far beyond their borders. 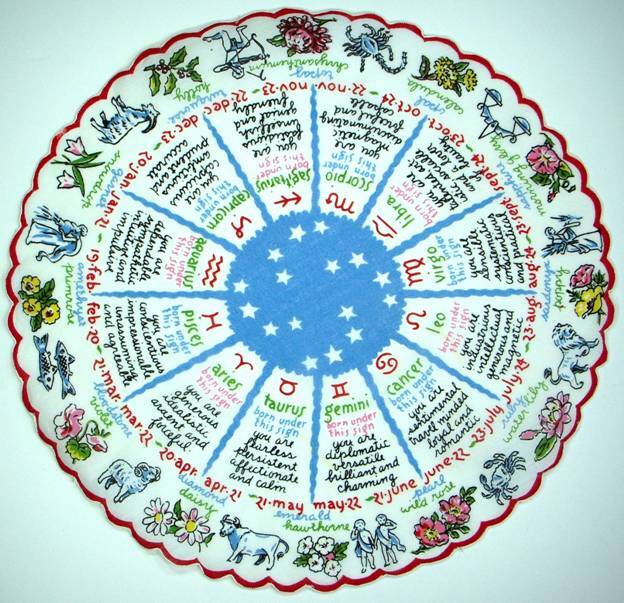 This blog in no way begins to explain the study of astronomy. 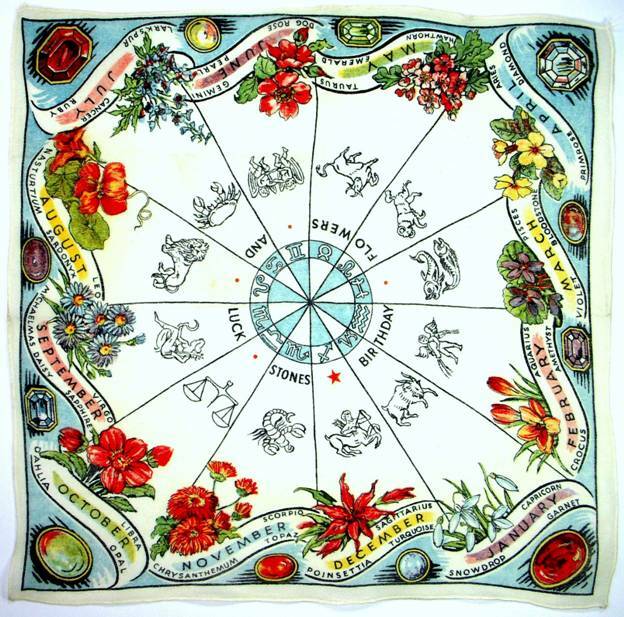 We’re merely including a few interesting facts to supplement the handkerchief images, but oh, what an interesting science! 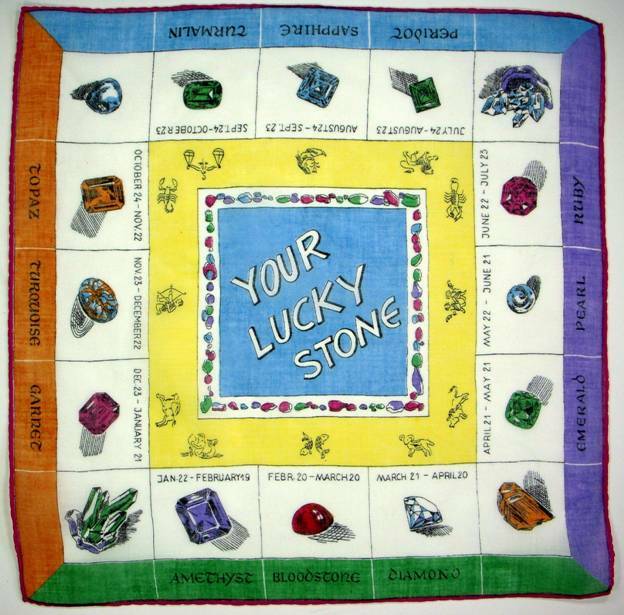 Speaking of birthstones, this was taken from the web. I cannot vouch for its accuracy, but am including it for fun. 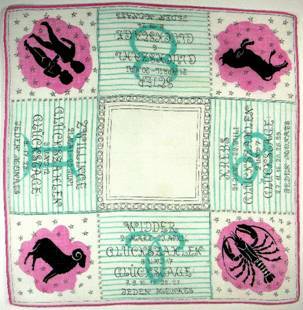 Some of my favorite hankies follow, like this very worn and thin handkerchief featuring the sign of Cancer. 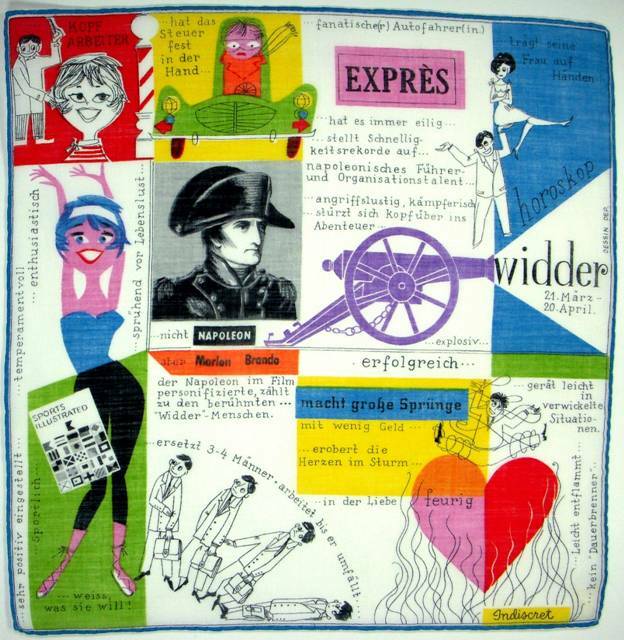 Written in French, it’s funky and hip, and employs a grid pattern to which the artist affixed a collage of photos, illustrations and pop art – everything from Rembrandt to Gina Lollobrigida to Satchmo. The Pepsi lid (we were still in the age of glass bottles) harkens back to Warhol’s soup can art. 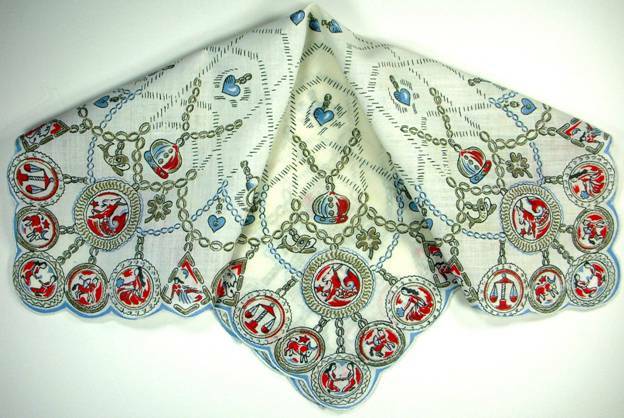 This German Aires handkerchief is Madison Avenue snazzy, snappy, and just plain fun. From maximum information above to minimalist chic below, Keefe once again lets her pen run wild in fanciful curlicue figures. Time-lapse photography from photographer Maciej Winiarcyzk taken in areas of mainland Scotland. Delightful, as usual. Thank you!